Did you participate in one of last Saturday’s women’s marches? I wasn’t able to go, but it was exciting to learn that this year’s march in Chicago, where I live, was even bigger than last year’s. I love seeing the creative, funny, poignant, powerful signs that marchers create, and the original work that artists create for the marches. 1) Maia Weinstock published her annual in memoriam column for Scientific American of notable women in STEM who have passed away in the past year. I was only familiar with a few of the women on the list; it was cool to learn more about their contributions to neuroscience, aerospace, math, and more. 2) This week also marked the passing of groundbreaking science fiction writer Ursula LeGuin at 88. Our friend Monica Byrne shared a bit about LeGuin’s impact on her own career on twitter. 3) Rosie the Riveter has become a ubiquitous image; Leslie Knope dressed as her for Halloween, an updated version was a magazine cover about last year’s women’s march. But who’s the “real” Rosie the Riveter? The name Rosie comes from a song and was named for Rosalind P. Walter, whose name you might recognize if you watch a lot of PBS. (She became a major benefactor.) Norman Rockwell modeled his version on Mary Doyle Keefe. But the “We Can Do It” Rosie, Naomi Parker Fraley, passed away at 96 earlier this week. Her obituary serves as a mini-history lesson of Rosie the Riveter and a glimpse into the work women did supporting the war effort during World War II. 4) Have you ever heard of Georgia Gilmore? Neither had I until I read this story on NPR about the Montgomery, Alabama "cook, midwife and activist whose secret kitchen fed the civil rights movement." Her story is as important as it is unknown. She organized other women who cooked for civil rights activists, and the money they raised helped fund alternative transportation during the Montgomery Bus Boycott. 5) In more current events, I loved this story about Jessica Chastain and Octavia Spencer teaming up to ensure that Spencer’s pay would be equal to Chastain’s for a movie they’re starring in. Women of color are typically paid significantly less than white women, who are in turn paid less than white men. Just talking about what they were getting paid created the opportunity for Chastain and Spencer to work together for parity. It's been a big week for women in the news, from Shalene Flanagan winning the New York City Marathon on Sunday to some historic election victories on Tuesday. I've been working on some new interviews for the site, and I'm so excited about the women who are going to be a part of Girls Like You and Me in the coming months. I also went to a get-together for alums of my high school, which I always look forward to. I got to catch up with some old friends, and make plans to get together again soon... And, as always, I came across quite a few things I wanted to share with you this week! Shalene Flanagan after she won the New York Marathon last Sunday! 1) Last Sunday, Shalene Flanagan became the first American woman to win the New York Marathon in 40 years! Not only is she an incredible athlete (seriously- have you ever seen elite marathon runners? They're amazing! ), she's been a big part of building a supportive community of elite American women runners, and they've all been running faster as a result. 2) My friendships with other women are some of the most important relationships in my life, and Roxane Gay's 13 rules for female friendships are funny, pointed, and mostly just true. 3) Speaking of women I wish I were my real-life friends, Aidy Bryant is one of my favorites on Saturday Night Live- the music videos she pops up in are my favorite scenes in recent years. I loved this profile of her- she's just as sweet, sharp, and funny as you'd expect. 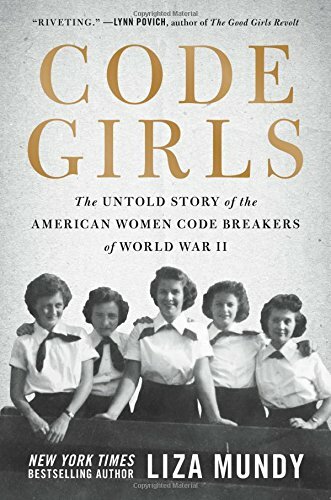 4) Hidden Figures showed us how women were a vital part of NASA; now Code Girls is revealing how American women worked as code breakers during World War II. 5) Today, November 11, is Veterans Day. Did you know that more than 2 million American women are veterans? Women comprise almost 10% of veterans, and that percentage is expected to double by 2040. Female vets are fighting for the recognition, respect, and services they deserve. 6) A whole slew of women won election to state and local offices this past Tuesday. My favorite story: A county officeholder in New Jersey posted a sexist meme in response to the Women's March in January. That sexist act inspired Ashley Bennett to run against him- and she won! 7) Women's election victories are even more exciting because it turns out that women are pretty darn effective legislators, and just plain get more done than their male peers. 8) And last, one of my favorite sources of political and social commentary, Teen Vogue, has a special guest editor for their newest issue: Hillary Rodham Clinton. I really enjoyed her letter to her 18-year-old self, especially her advice to "take risks, and don’t be afraid to get caught trying." 1 ) LEGO Women of NASA are here! Creator Maia Weinstock told us about designing them, how she chose the women who are included, and how the set was chosen for production. Mine should be arriving later today, and I can't wait! Congratulations, Maia! 2) Birth Control Access: Contraception is expensive when you have to pay out of pocket, most women who need contraception use is, and the burden for paying for it largely falls of women. Since the passage of the Affordable Care Act, insurance companies have been required to fully cover it, making birth control more accessible to more women. A few weeks ago, the President rolled back that mandate. The consequences of this for many women will be devastating. Birth control could become unaffordable, and without reliable access to contraception, they will no longer be able to determine if and when they want to become pregnant. That will have a negative impact on America's economic growth. 4) Have you all seen the "Mother Before" Instagram? I can't get enough of it. Women submit photos of their moms before they had children, along with a few sentences about them- personality, hobbies, career, partners, all kinds of things. Most of my friends have kids now, and I sometimes wonder if those kids will ever have a sense of the girls I knew growing up or the adults they were before kids.